It can’t do its job unless it’s welcomed in. Vampires have other doors to try, but your email doesn’t. It needs a “yes” from your recipient to get any insight. It’s not an ideal system. But it’s also not your only option. Enter – email tracking. Accessible as a gmail extension, it’s the quickest, easiest way to see when your emails are being opened. Below are 11 ways that email tracking totally surpasses what a gmail read receipt can do. Here’s an email tracking plug-in for Gmail (free trial that doesn’t ask for a card). A gmail read receipt requires action from your recipient. It puts the control in their hands and asks them to do something for you. 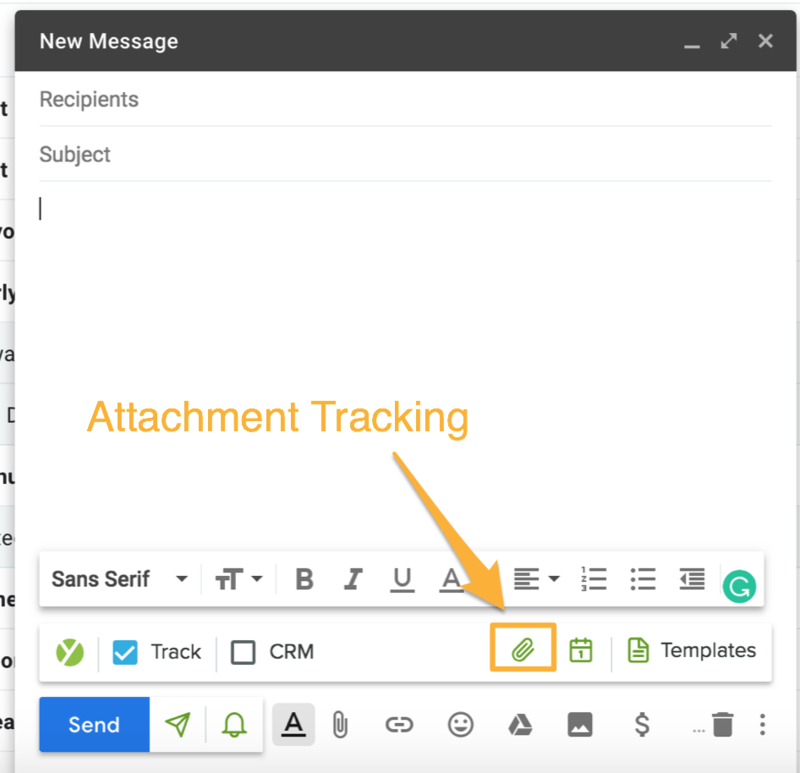 With email tracking, your recipient won’t know you’re tracking your emails. It requires absolutely nothing from them. Email tracking goes beyond just letting you know when your email has been read. When and for how long your attachments are being viewed (i.e. 5 seconds on the first page of your PDF, 2 seconds on the third page, etc.). To get this information, only one person needs to take action: you. 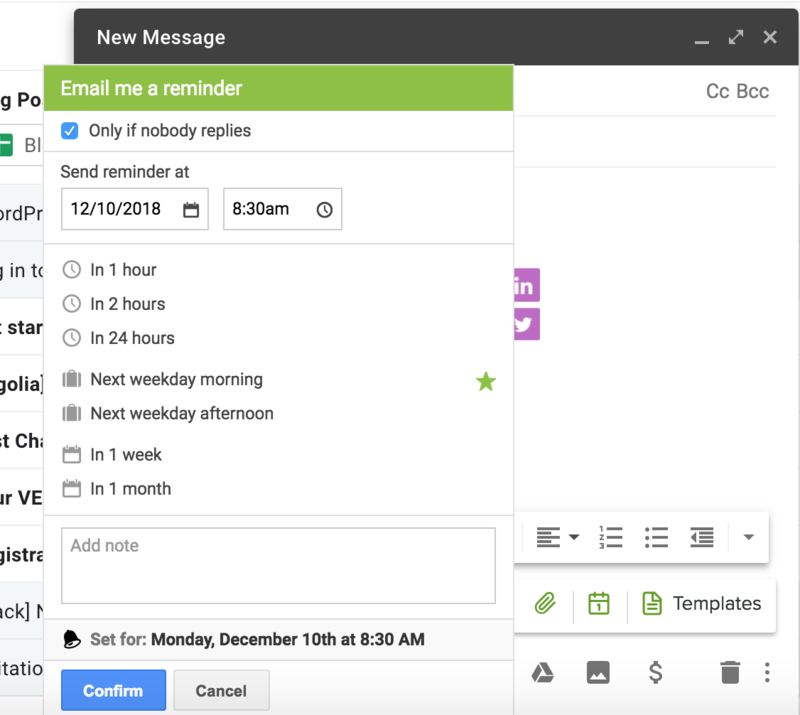 Spend 60 seconds up-front to add the plug-in to your Gmail inbox. From there, tracking happens automatically. A gmail read receipt only reveals the first time your email is opened. That doesn’t give you the full story. Email tracking flags each open (and reopen), so you can better gauge their interest. The bottom line: Why stay in the dark wondering whether your messages are being opened? With email tracking, you can turn on the lights and see their engagement in real-time. In the past, I would send an email and it would disappear into a black hole. I wouldn’t know if it was received, opened, or viewed. Now I have visibility into how my audience is interacting with my email, which allows me time to communicate better (I don’t want to pester), and if I haven’t received a response but I know that the recipient is viewing my email, it could be a cue to try a different approach. Click here to set up email tracking in your inbox. Location information can change your entire perspective on a sent email. Last week, I had sent out an email to a client as a follow up. It included a presentation on one of our new products. I got the notification that he’d opened the email, and I got the notification that he had looked at the presentation, which was awesome. He’s in New York, and it said he opened it in New York. Almost immediately after that, I got notifications that the attachment was being opened but in Atlanta, and by multiple people. I could tell that, because the client’s headquarters is in Atlanta, he had forwarded it to his leadership team, and there’s no way I would have gotten that information if it wasn’t for Yesware. Not only does email tracking show you forwards to headquarters, but it also tips you off when your recipient is on vacation or has just returned. This way, if you’re waiting on a time-sensitive answer, an overdue deliverable, or a contract sign-off, you’ll stay up to date on their whereabouts. If you call a desk phone and no one’s there, did you really call at all? Email tracking shows you what device they’re on (desktop vs. mobile) so you know whether to follow up via desk or cell phone. You could write the perfect email, but if you’re sending at the wrong time it could get buried in an inbox. We wanted to change that. In the process of figuring out the best time to send an email, we looked at how reply rates varied across major metropolitan areas around the world when sent at different times (more on those findings here). In turn, we made a free tool that shows a recommended time to send an email based on location. Pro tip: You can use our email scheduler Send Later to get your work out of the way. You can save different versions of email messaging to see which gets the most opens and replies. With Reminders, you can add a note to yourself so you can have the right context handy when you need it. At a designated time, a reminder pops up in your inbox, flagging future you where you knew you’d be working. Why does following up matter? About 90% of emails that get replies do so within the same day. When you remember to follow up next-day, your chances of a reply-rate rise to 21%. If you already know what you want to write in your follow-up, you can automate your entire email sequence. 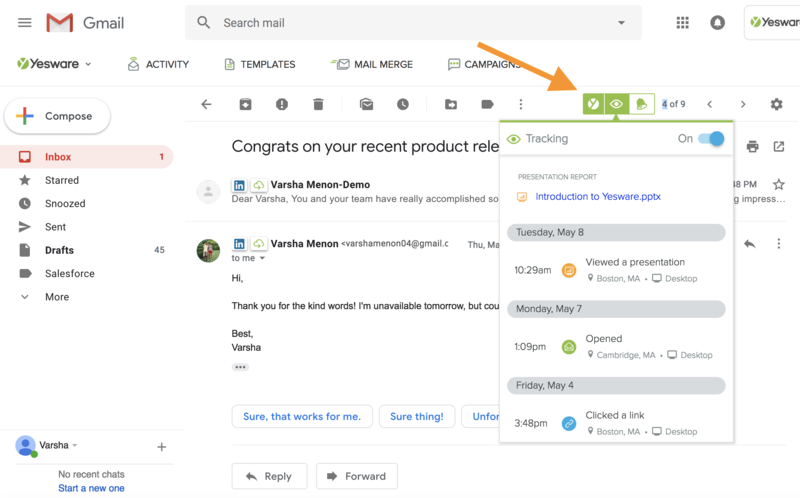 Because email tracking logs opens and replies, you can set any secondary stages to send to those who haven’t opened your first email or those who haven’t replied. You write your messages upfront and then schedule it with send criteria for when you want it to go out. You can schedule each stage to go out to multiple people at once, scaling the output of your writing. 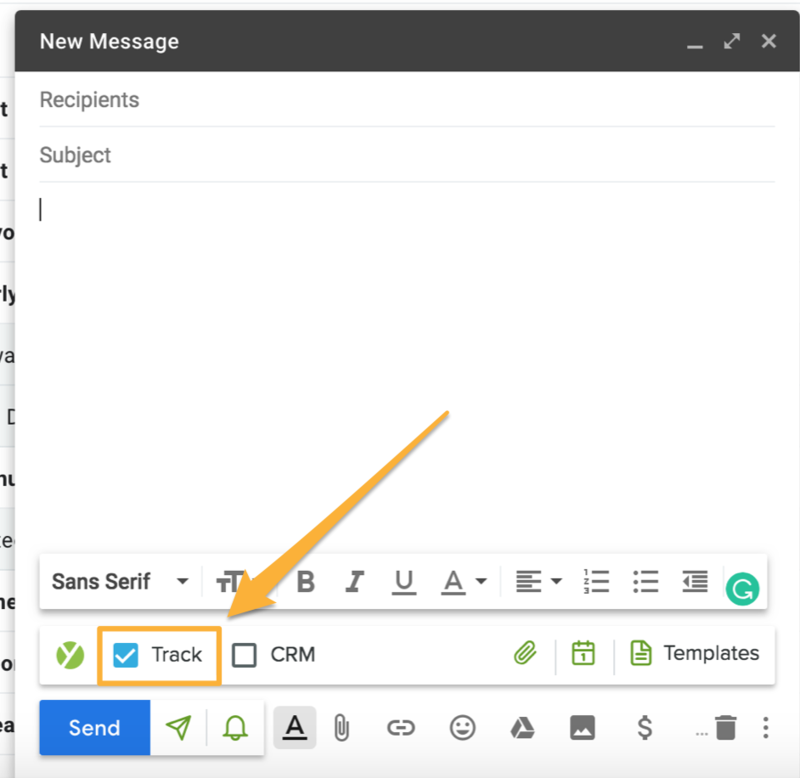 Users simply upload a CSV file (or Salesforce list) as their recipient list and include merge fields in the email body that personalize to each person. From there, you can add secondary stages by drafting new messages or inserting existing follow-up templates (try one of ours). 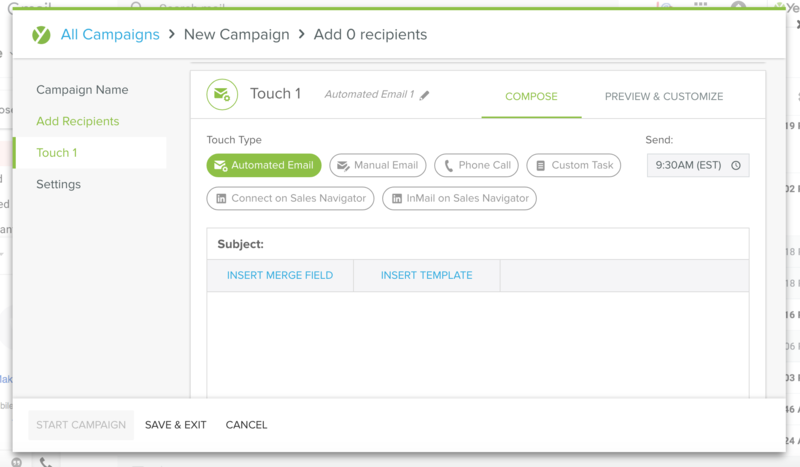 See who opened, clicked, or replied to emails in the Yesware Campaigns module. Want to see how engaged your audience is with your content? Presentation tracking peels back the curtain for any PDF, PPT, or PPTX document. After you send, you can see who’s looking at your presentation (and for how long) by clicking “View Report” in Email Tracking. The data puts hard numbers on what works, so you can improve your message by focusing on what’s working. Four of the sweetest words in the English language: No more data entry. 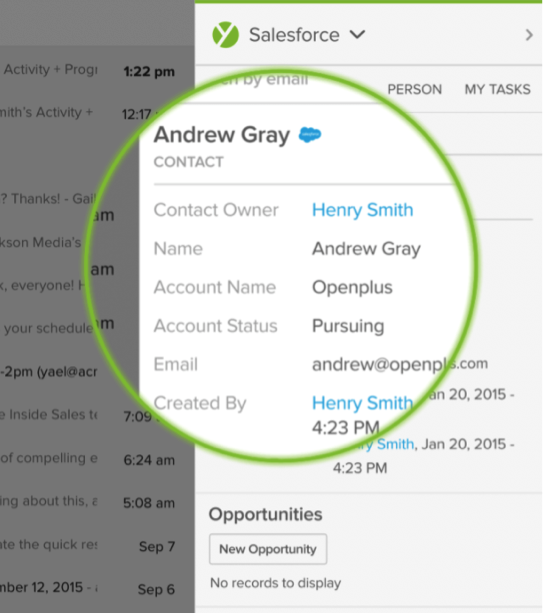 Email tracking collects recipient engagement and auto-syncs it to CRM. No more setting aside hours out of your day. Start pushing emails, calls, and meetings to the correct Salesforce.com record in real-time without any customization work. 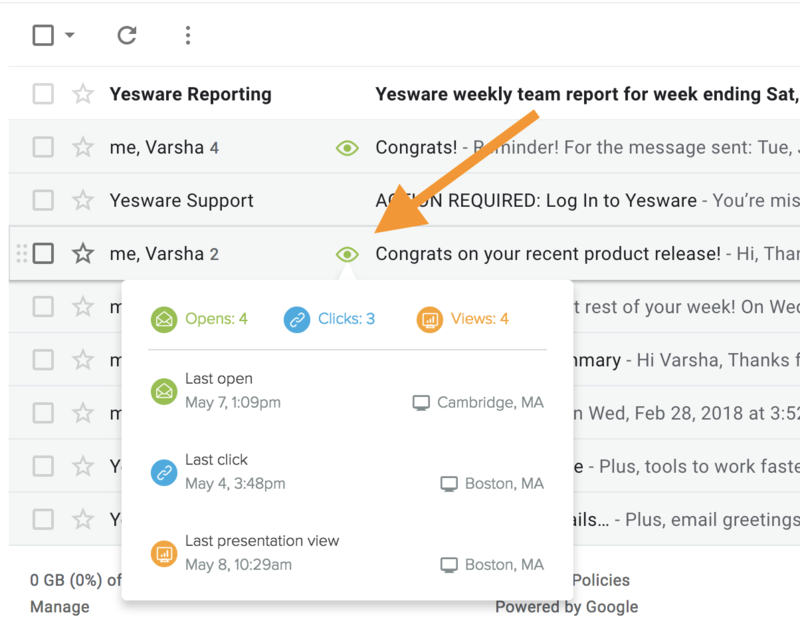 Yesware is a gmail tracking tool that makes working out of your inbox easy and gives you insights that a gmail read receipt can’t. Below are three ways users receive email tracking data — from real-time push notifications to in-depth reporting on our app site. The moment a Yesware users’ email is opened, we send an instant desktop notification letting them know. 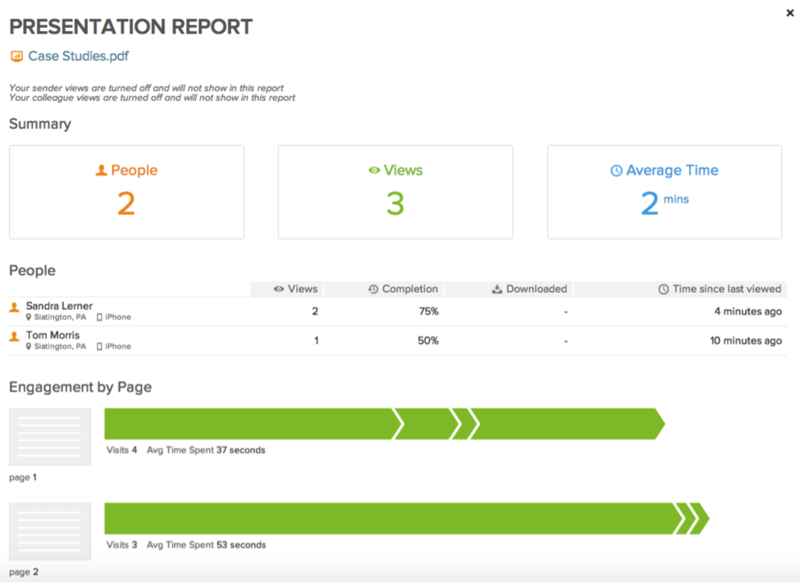 Yesware also has an Activity Feed that makes tracking data more actionable. This way you can stay engaged with your recipients and know how to follow-up with them effectively. The insights you need to do your job should live where you do your job. It’s that simple. Sign up for a free 14-day trial of Yesware for Gmail to see what these tools can do for your inbox.